First up! The Blogger TPR Challenge blog hop closes in 14 hours. Get on it! So far L. Williams is winning the gift card...because she is the only entrant. Womp womp. Second up - you may notice it's been a week since I last blogged. My life has changed in ways I both predicted and could never have predicted in the last two weeks, (no, not pregnant). The only part I can share right now is that we're couch surfing/living out of a suitcase with friends because we sold our old house before getting the keys to the new one (hopefully today), which is all kinds of fun with two big hairy shedding dogs with separation anxiety. We did on-property XC schooling yesterday. At home, we have multiple banks, ditches, a corner, logs, trakheners, stone walls, and other things, all no higher than novice, which is pretty cool. September 2014 Cathy clinic. Baby corner in the background, the jump we're over is adjustable height. The good: he jumped a faux ditch almost without hesitation on the first try. We did a ton of that at our XC schooling in late April, so that makes sense. He was brave and game and quiet over most things, except for a head flipping incident after a log midway through a course, but I think I caused that by going to the reins too quickly to rate him. The less good: he lost his mind at a pile of 3 railroad ties that may have been a foot high that I asked him to go over mid-course. Like, it took me a minute to get him over that, and he could have stepped over it no problem. My trainer said it was the location - next to one of the banks, in a little depression. More from last summer, no pics were taken yesterday. I tried hard to focus on staying quiet and relaxed like our last jump field lesson, but there's a fine line between enough leg to keep him committed and quiet and relaxed. I'm still feeling it out. 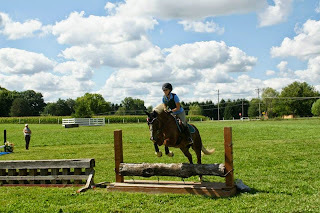 Our only refusal, though, was at the logs and at the down bank (which we haven't done in nearly a year), and the only thing he crazy over jumped was when we put a stadium fence over the faux ditch. Overall, though, I was happy. Most jumps were quiet and brave and in a good rhythm. Should get the keys to the new house today, so I'm not sure what this week will look like for the pony! Jealous y'all have XC fences on the property! Yes, I do not take that for granted! I am so appreciative that I can embarrass myself over our own ditch and bank here rather than in a public place. Doesn't seem likely. :( Maybe tomorrow. Congrats on the house! Moving can be such a crazy time. Just be thankful you don't have a horse a horse to be "homeless" with. Now that makes for an interesting experience. XC schooling looked fun! Oh yes, that sounds horrible! A high maintenance dog with incontinence is hard enough! Life has been crazy and I've been the laziest blogger when it comes to hops/contests... bad excuse I know! Love the XC pics. 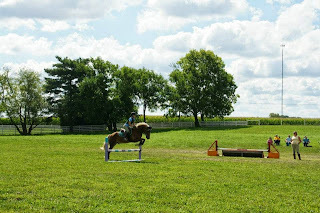 i honestly had every intention of doing the hop... but did not remember ONCE while at the barn. perhaps i am still scarred from helping our barn taking the temps of 30 horses twice daily for two weeks? 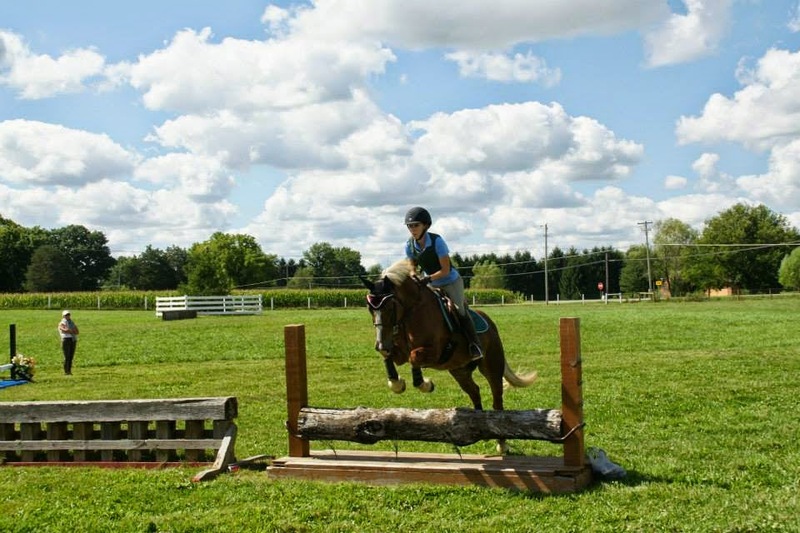 anyway, i'm also jealous about the on-property xc jumps haha - sounds like a fun time! good luck with the new house! Best of luck with all the changes :) And I'm super jealous of your on site x country jumps - looks fun! Ugh, hope the house stuff gets figured out soon! We have some little random cc jumps but man how fun it would be to have lots and really good ones! !